Throughout John Henry’s career, he has pursued a rigorous formal thinking that links his 1960s Minimalism to the experiments of the Russian Constructivists of the early 20th century. Henry’s works are three-dimensional drawings, moving beyond the confines of paper and into the world, framing each view in surprising and evocative ways. Henry started as a painter, but with his move to three dimensions, his works seem to mirror the thrusting painted forms of Franz Kline, another artist interested in the hidden skeletons of our built environment. Henry learned how to construct the world from a young age—his father was a contractor, which gave the artist a deep understanding of what is technically possible, not just what is aesthetic. Henry is adept at balancing delicate forms against sturdy trunks of steel, adding color to complement and challenge the forms in our urban landscapes. 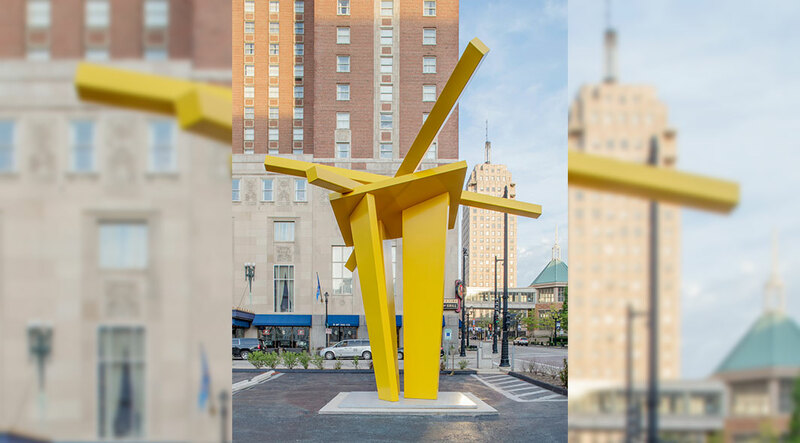 After he graduated from the School of the Art Institute of Chicago, Henry was an advocate for the value of large-scale outdoor sculpture—to mirror the rapid changes happening in American cities, and to provide artistic experiences outside of the museum’s white cube. In 1977, with contemporaries Mark di Suvero, Jerry Pearl, Linda Howard, Kenneth Snelson, Lyman Kipp, Charles Ginnever and Frank McGuire, Henry helped found Construct Gallery, Chicago, as a way to give a platform to sculptors. Like many artists interested in finding public support, Henry was an early advocate for Chicago’s Percent for Art program, to use a portion of building budgets to place art work outdoors in public spaces, plazas and parkways. Today, Chicago is recognized as a premier urban environment, partially because of the consistent support of world class art in the public realm. Henry and his cohorts helped set the stage for art as a cultural marker for place. In Zach’s Tower, Henry balances slender, buoyant lines against strong anchoring legs. As with most three-dimensional sculpture, this piece evolves as the viewer walks around it. Henry’s work frames the geometries of our built environment, breaking down the outsize scale of skyscrapers and creating small vignettes. Henry’s work is vibrant and expressionistic against 100 years of architectural history found in Milwaukee’s downtown, enlivening the solidity of buildings with inventive visual experiments. Henry has been presenting his work in museums and galleries around the globe since the 1980s, with recent shows in Germany, Italy and across the United States. Public collections include the Library of Congress, Washington; the Aspen Art Museum; The British Museum, London; the Fort Worth Art Museum, Texas; The Nathan Manilow Sculpture Park, Park Forest, Illinois; the Lynden Sculpture Garden, Milwaukee; and the Sheldon Memorial Art Museum, Lincoln, Nebraska. He has founded a sculpture park in downtown Chattanooga, adding an important cultural resource to his community.